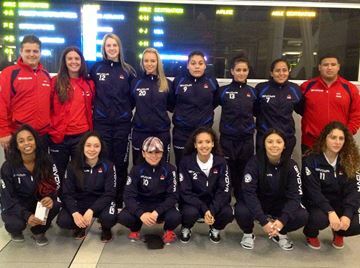 COLOMBIA - The Canadians may not have as much experience as most of the teams in the 2013 AMF Women's Futsal World Cup, but they make up for it with swagger, says Mississauga's Alison Lemon, one of 12 players representing her country beginning tomorrow in Colombia. Futsal is similar to soccer except it's played indoors on a tile surface and there are certain rules in place to make it a more fast-paced game. Canada is going to the 16-team tournament for the first time in the event's 31-year history and the club is going in with confidence after tying defending champion Catalonia 2-2 in a qualifying match in September at Brampton's Powerade Centre. "We've had eight months to prepare for this whereas most countries have had four or five years to get ready," said Lemon, who played senior women's soccer for the Erin Mills Eagles over the summer. "We're coming in as underdogs and I'm sure every country going into this thinks that Canada's a joke, but they don't even know what's going to happen because we have a really good team." The Canadians begin round-robin play Thursday night against Colombia. From there, they'll take on Morocco on Saturday and Australia on Monday. The tournament concludes Nov. 16. Most members of Team Canada are from the GTA. Lemon says the team showed a lot of character in the tie against Catalonia, a fast team that the Canadians expected to put up a big challenge. "We were going in thinking it would be a really hard game and we didn't want to get discouraged, no matter what happened," Lemon said. "It was a huge eye-opener, but mainly just for them. Their coach actually exchanged shirts with me and said he was really looking forward to playing us at the World Cup." The team also consists of Danielle Krzyzaniak, Nicole Carvalho, Amanda Irmya, Ashley Osorio, Valentina Gonzalez, Nakicha Robinson, Ana Oliveira, Jalen Simms, Keyla Moreno, Monica Cordero, Kassandra Castaneda, coaches Pedro Gonzalez, Leonardo Herrera and Gabriel Sosa, director Leticia Barroso and manager Maria Simms.